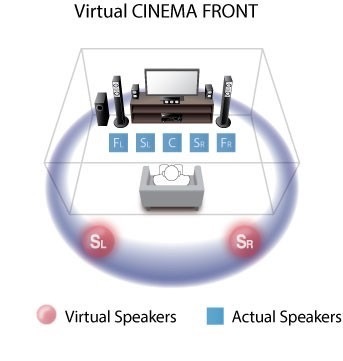 Enhance your home movie experience with Virtual CINEMA FRONT. There’s something almost indescribably awesome about creating an authentic movie theater experience in your own home. It’s convenient, comfortable – and best of all – your own. You get all the fun choices: Do you want a simple setup with just a few AV devices in your living room or a complex one that rivals local multiplex cinema? And you get all the challenges, too. One of the most common issues would-be home theater enthusiasts encounter is space: Many people simply don’t have an area dedicated solely to the home theater of their dreams, and even a basic 5.1 channel set up can take up a lot of real estate. That’s not a problem with Virtual CINEMA FRONT, exclusively from Yamaha. Virtual CINEMA FRONT is featured in the AVENTAGE line of receivers, among other Yamaha AV products. In the Virtual CINEMA FRONT setup, you can place all five speakers and a subwoofer at the front of your room. Wire your speakers to your Yamaha receiver, then activate the built-in YPAO™ (Yamaha Parametric Acoustic Optimizer) to ensure that the listening area is tuned to provide the best audio experience possible. The speakers project the sound onto the walls, creating a surround effect that is nearly indistinguishable from having real speakers in the back of the room. Virtual CINEMA FRONT technology makes creating your own little slice of home theater heaven easier and more convenient. So whether you have an entire room to fill with AV gear – or just a corner of the living room – you can enjoy the benefits of surround sound.